The new research projects will be introduced by the Principal Investigators (PIs) at the 6th annual workshop of the Swiss JRC (January 31-February 1). The EPFL PIs for the proposal ‘Monitoring, Modelling, and Modifying Dietary Habits and Nutrition Based on Large-Scale Digital Traces’ are Robert West, Arnaud Chiolero, and Magali Rios-Leyvraz. The project will revolve around three sets of research questions: monitoring and modeling, quantifying and correcting biases, and modifying dietary habits. Marios Kogias and Edouard Bugnion will introduce the project ‘TTL-MSR Taiming Tail-Latency for Microsecond-scale RPCs’ in their role as PIs for EPFL. The research proposes to make Remote Procedure Calls (RPCs) the “first-class citizens” of datacenter deployment by reorienting the overall architecture, application API, and network protocols involved. The project is based on a new RPC-oriented protocol called R2P2, which separates control flow from data flow and provides in-networking scheduling opportunities to tame tail latency. 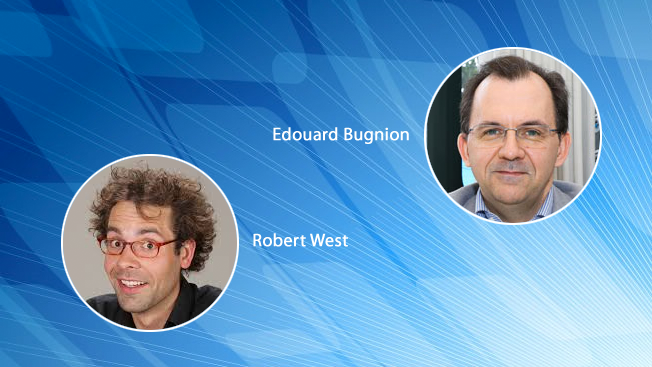 The third confirmed Swiss JRC project from EPFL is ‘Hands in Contact for Augmented Reality’ with Pascal Fua, Mathieu Salzmann, and Helge Rhodin as the PIs. Along with the PIs for Microsoft Research, they will work on accurately capturing the interaction between hands and objects they touch and manipulate. This is crucial for accurately modeling the world in which we live. After the conclusion of Phase II of Swiss JRC in 2018, the renewal of the association was announced last summer for five years leading up to 2022. The new round of projects are now raring to go, continuing the decade-long rich tradition of the Microsoft-EPFL-ETH Zurich research collaboration.